It has been the eternal dream of humans to seek ways of maintaining the natural health and beauty of their youth. 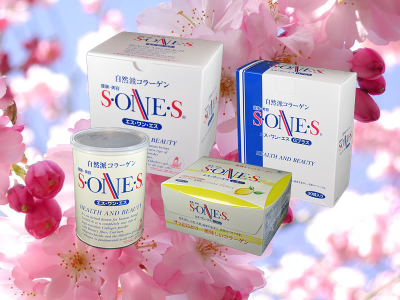 For more than 20 years, men and women in Japan have made S·ONE·S their first choice, and one of the top premium collagen brands in the country. Now available in the United States and Canada, S·ONE·S, S·ONE·S Lemon and S·ONE·S G Plus are the highly acclaimed and much sought-after Japanese collagen supplements, developed with a proprietary blend of natural ingredients to counteract the aging process and to improve both the skin’s beauty and the body’s overall health from within. Using only premium collagen, along with the finest sources of chondroitin, glucosamine and hyaluronic acid, S·ONE·S, S·ONE·S Lemon and S·ONE·S G Plus have been scientifically studied and approved, following years of medical research. Their unique blend of collagen and active ingredients provide a pure, natural formulation that includes no artificial flavorings, preservatives, or sweeteners. Within these pages, you will learn all the ways that S·ONE·S, S·ONE·S Lemon and S·ONE·S G Plus can benefit you, and the science behind it. We invite you to read and learn, and ask questions if you’d like. We’re happy to answer! Then visit our SHOP page, and try an S·ONE·S product for yourself.